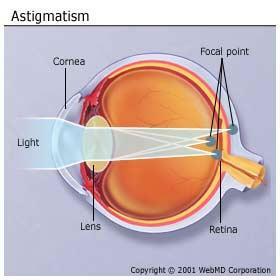 Astigmatism is a visual condition caused when some surfaces of the eye are oval shaped….like a football or an egg. These surfaces in the eye that are oval shaped can be the cornea (the front of the eye) or the lens (inside the eye). Most often astigmatism is caused by the cornea being oblong or oval shaped. This oblong shape causes the light rays that enter the eye to be distorted and not focus properly on the retina in the back of the eye. If you have uncorrected astigmatism, you can have various symptoms such as blurry vision, eyestrain, tired eyes, headaches or fatigue. Here are several links to websites that have online testing for astigmatism. Check them out!! Astigmatism can be quickly and easily corrected with eyeglasses, contact lenses (called astigmatic or toric contacts) or Laser Surgery (called Lasik). If you feel that you may have astigmatism and you need correction OR if has been more than 12 months since you have seen an eye doctor…..its time for you to schedule an eye exam! If you need an eye exam in the Fort Lauderdale area – you can call our office at 954-763-2842 or schedule an appointment ONLINE at www.FLEyecareEyewear.com. Our Optometrist is Dr Dawn Bearden. She has been an eye doctor for over 17 years! !